The SS-Hauptsturmfuhrer Michael Wittmann Panzer Ace T-Shirt is a single sided print in grey. 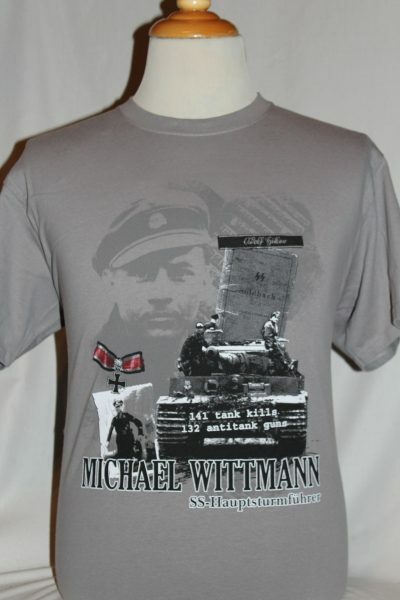 Front Design Only: Image of Wittmann's Knights Cross with Oak Leaves and Swords. 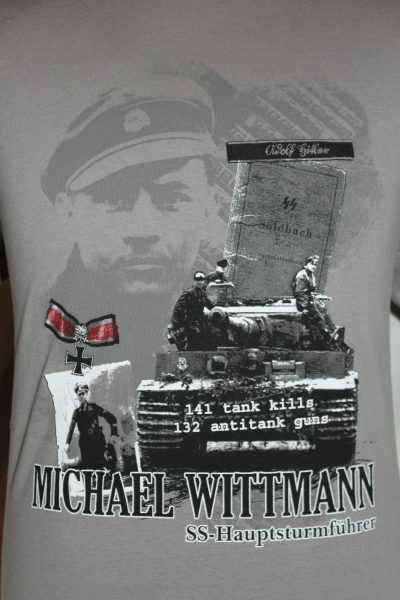 Photograph of Michael Wittmann commanding officer of the 1st company 101st Heavy Panzer Battalion Leibstandarte, Tiger I Tank, soldier pay book, and text numbering the 141 tank kills and 132 anti-tank gun kills. Port 100% heavyweight cotton, 6.1 oz., preshrunk t-shirt. This shirt has double-needle stitching throughout; seamless rib at neck; shoulder-to-shoulder tape. This shirt will wear well and retain its original color and decoration after multiple washings. Note, we use the best quality preshrunk shirts available!